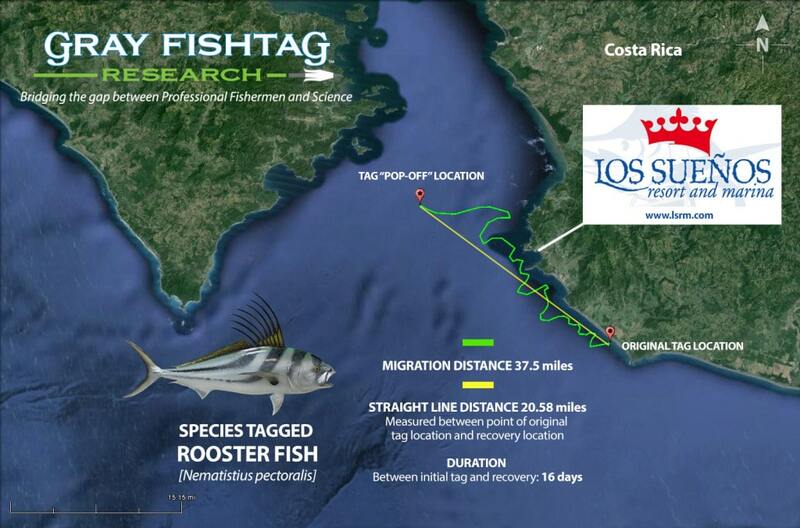 On January 22, 2015 members of the Gray FishTag Research team, Dr. David Kerstetter (Nova Southeastern University), Mr. Bill Dobbelear, and advisory board members Mr. Zsolt Szekely and Mr. Carter Takacs, successfully deployed the first ever pop-off satellite archival tag (PSAT) on a roosterfish (Nematistius pectoralis). The roosterfish was named in the loving memory of our friend Todd Flanders. 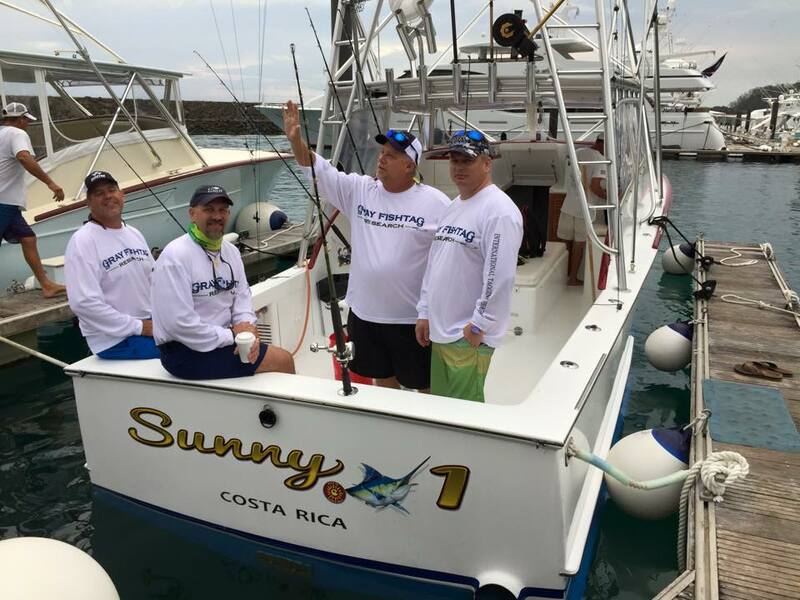 The sat-tag deployment took place while fishing with Captain Ishmael of “The Sunny One” and 1st Mate Christian Bolaños from our Official Research Center Los Sueños Resort and Marina, a five star resort and marina centrally located in Herradura, Costa Rica (http://www.lsrm.com/). The roosterfish measured in at 35 inches and weighted approximately 17 pounds at the time of sat-tag deployment. The sat-tag was attached to the roosterfish for 16 days. During that time, the roosterfish stayed in the local waters and had a migration distance of ~37.5 miles from the location of sat-tag deployment to the sat-tag pop-off location. The roosterfish’s vertical swimming pattern showed very rapid dives to depths averaging 19ft and maximum depth of 93ft, followed by rapid assents to water surface (See Figure 1 below). The roosterfish had a horizontal movement which showed an inshore to offshore and back pattern. During that time, the roosterfish exhibited a movement and migration pattern consistent with the behavior of a predator fish foraging for prey items or food. The results of this first of its kind roosterfish sat-tag deployment demonstrate two important factors. First, a roosterfish can handle the initial stress of having a sat-tag attached, as well as swim and function normally with the sat-tag attached. Two, roosterfish do not just stay in one location or live on one rock off the coast of Costa Rica. 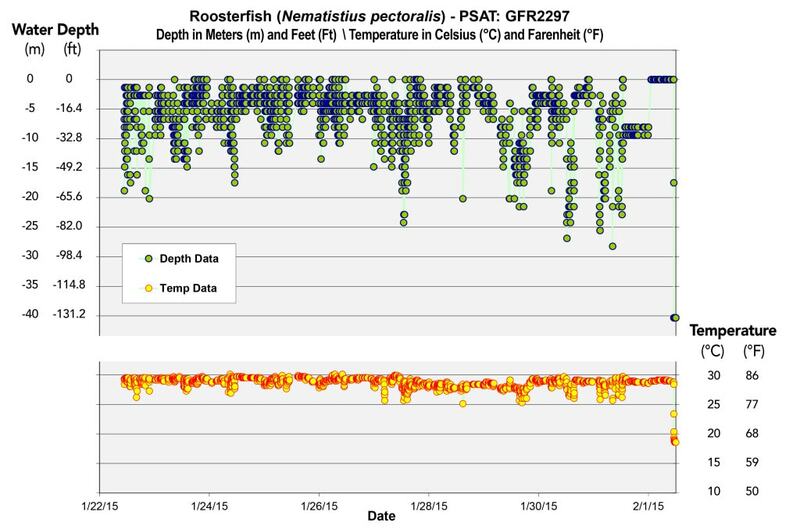 Roosterfish migrate and exhibit dives to depths greater than 75 feet (See Figure 2 below). 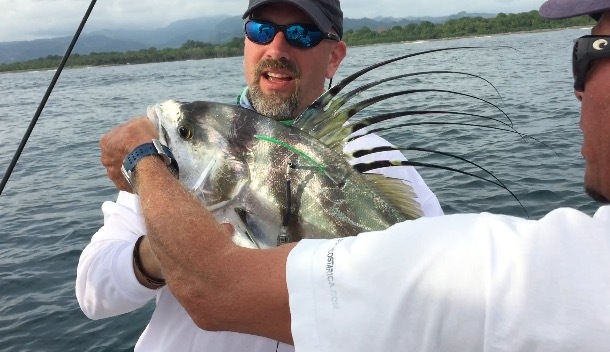 Gray FishTag Research has plans to collect more data and deploy more satellite tags on roosterfish in the waters off Costa Rica. The success of the Gray FishTag Research program and satellite tagging of roosterfish would not be possible without the support of our research centers: Crocodile Bay Marina, Los Sueños Resort & Marina, Marina Pez Vela, and The Zancudo Lodge. If you are interested sponsoring a satellite tag, please contact Gray FishTag Research at info@grayfishtag.org or 1-844-824-8353. Any or all data collected by Gray FishTag Research is available for Free to any or all interested parties. Pleas send your inquiry directly to our in-house scientist Travis Moore. He can be reached by calling 1-844-824-8353 or via email at info@grayfishtag.org. * Preliminary PSAT data analysis; fish migration track is only an approximate estimation.